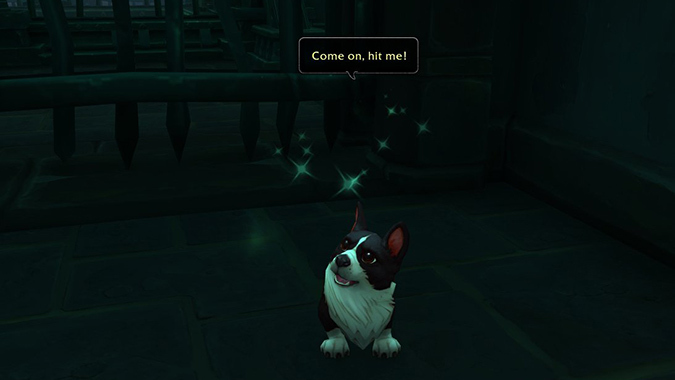 Is it okay to punch a corgi if he asks you to do it? What if you know it’s just an illusion, and that’s definitely not really a corgi politely requesting that you smack it silly? Would you be all right with attacking it even as it’s staring at you with those big soulful eyes and helpfully wagging its little tail as it encourages you? I spent a good ten minutes deliberating these very questions on my latest Alliance alt. Then the goggles wore off and I punched Flynn right in the kisser. No regrets. QftQ: I’m fairly certain I read somewhere that the next WoW patch is introducing multi-core usage. Is this correct? Has WoW only been utilizing a single CPU core this entire time? Yep! WoW has always been one of those games that could run effectively on a potato if asked. Well, maybe not a potato — but I played vanilla WoW on a tablet PC with few issues. Unfortunately, it also wasn’t exactly taking advantage of the latest technology, like, you know, multi-core processors. In theory, the changes they’re working on should improve performance for people with high end machines. It’s being tested on the PTR at the moment, and should come into play when 8.1 launches next week. Fingers crossed! If you go to the bay hidden on the west cost of Zandalar, underwater and toward the back of it, there is what appears to be a Tortollan wedding going on. Not enough to make me like Tortollans, but it’s cute. Yes there is! We’ve actually got a couple of galleries of underwater locations — one of them focuses a bit more on Alliance locations (but includes that odd little wedding), and the other features five Horde underwater dives. There’s no actual purpose to any of these locations — or at least, there’s no real purpose as of yet. But it’s kind of cool that the Tortollans have this little underwater society going on, one that you really wouldn’t notice unless you decided to dedicate some time to just swimming around. The bars include NPCs you can talk to, as well as vendors — they’ve actually got quite a bit going on! Okay so Fun future expansion stuff. We defeat Azeroths bads. But then the void lord start getting all voidy and stuff. So how do we fight them??? Space Expansion. Would you play wow if the next Xpac (or a future one) suddenly took us into the universe? And i specifically mean that we end up with borderline Starcraft type armor and looks? I mean…we were kind of in space when we went to Argus, and we’ve been on different planets before. I’d be happy with an expansion that took us somewhere else — I like the exploratory aspects of expansions that featured other worlds. New locales like that let Blizzard’s design team put together some really weird, otherworldly zones and scenery that just wouldn’t work on the Azeroth we’re more familiar with. I don’t know how on-board I am with StarCraft looking gear, but I mean…if it were designed well, it could be cool. What is going on with the BlizzardWatch podcast? There was a recording on 11.28, apparently, but I cannot find it to listen to it. I have not seen any announcements on Twitter, so am I missing something? I’m not sure exactly when you posted this question, but just so you know — we record the show live on Wednesdays, and the show is distributed on Fridays. If you’re a Patreon supporter, you’ll get an uncut version of the show — it includes the preshow — on Wednesdays after we’re done streaming. Shows that have been released will be posted on Twitter, there was a notification that went out when last Wednesday’s show went live. In addition, you can always hit the big “Blizzard Watch Podcast” logo on the right-hand side of the site to take you to the podcast page — it has links for all the Blizzard Watch and Lore Watch podcast episodes. Apologies for the lack of new shows in November, there were some personal issues that came up and took priority over recording. We should be back on schedule now, though! Something just occurred to me. When the time comes for the Pandaren to get their Heritage Armor, do you think Blizzard should make only one armor for both factions, or should they have a Huojin Set and a Tushui Set? That would be cool! I’m kind of curious how they’ll approach the Pandaren heritage armor, actually. They could go full Pandaren with something themed to Pandaria — but the playable Pandaren aren’t really from Pandaria. They could go with a Huojin/Tushui theme, and do something with similar armor models, but different color palettes. I almost think, though, that it would be more interesting to go the full Pandaria route. Pandaren from the Wandering Isle don’t really know all that much about Pandaria — by the time we encounter them, it’s been so long since they’ve seen Pandaria’s shores that even they kind of consider it a legend of sorts. If they really want to explore their heritage, going to Pandaria would fit that bill nicely. Plus, it would give Blizzard an opportunity to lead us through a quest chain that covers Pandaria’s history a little more in-depth, which is what they’re trying to do with the heritage armor chains anyway. Q4tQ: Does Sylvanas still have hair? It just occurred to me that she’s been wearing that hood ever since she became the Banshee Queen…and I can’t think of a time she’s ever taken it off…. Yes, she does. It’s long and greyish-white, you can see it in most cinematics. Running your hand through it feels like raking your fingers through a million cobwebs.